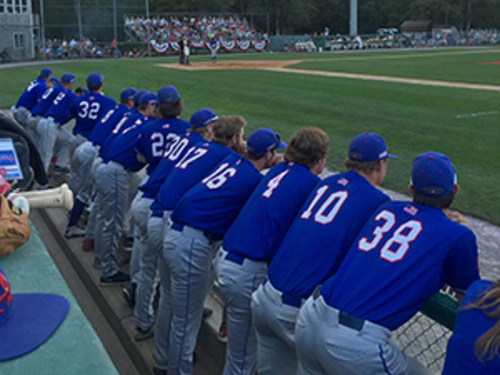 Chatham Anglers players look on during their team's 3-1 victory at Whitehouse Field on Sunday evening. HARWICH, Mass. – The East’s No. 4 seeded Chatham Anglers upset the division’s top-seeded Harwich Mariners by a final score of 3-1 on Sunday evening at Whitehouse Field. With the win, the Anglers advance the to East Division finals to face the Yarmouth-Dennis Red Sox. For Chatham, Parker Rigler went six innings, allowing just one run on four hits with four strikeouts. Isaac Mattson went 1 2/3 scoreless innings, allowing just one hit and recording four of his five outs via strikeout. Jeremy Vazquez and Stuart Fairchild each had a pair of hits in the victory. Packy Naughton went 5 2/3 innings for the Mariners, allowing three runs, two earned, on six hits with five strikeouts before giving way to Teddy Rodliff in the sixth. Zach Schellenger went the remaining three innings for Harwich, striking out six batters without allowing a single hit. Ernie Clement was a top performer at the plate, going 2-for-4. Chatham got on the board first, pushing across a pair of runs in the top half of the first inning. A double into the right field corner by Vazquez scored Mason Koppens, before a base hit by Fairchild brought home Vazquez. The Anglers added a third run in the top of the second inning, pushing the lead to 3-0 when John Aiello hit a no-doubt home run to left field. Harwich got on the board in the bottom of the third inning with a home run of its own to make it a 3-1 ballgame. Austin Filiere launched a ball beyond the center field fence just to the left of the 400-foot marker. Both pitching staffs dug in, allowing no runs for either team beyond the third inning. “I’m really proud of my guys for being able to [get these wins], especially after getting our [butts] kicked last night, 13-1, and to play the game they did today—I could not be more proud of the team,” Schiffner stated.